Dine at Granite City to Support SONE! Grab your family and friends and head down to Granite City in Omaha or Lincoln this Thursday, August 27! 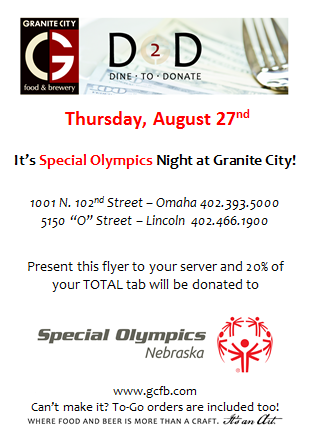 Our friends at Granite City are hosting a Dine 2 Donate day to benefit Special Olympics Nebraska! All you have to do is present this flyer to your server and 20% of your TOTAL tab will be donated back to Special Olympics Nebraska. This event also includes to-go orders for those diners on the run.